This is good news for the Moto Z users. Finally after months of anticipating, the Android 7.0 Nougat is finally rolling out to Motorola Moto Z Droid and Moto Z Force Droid. 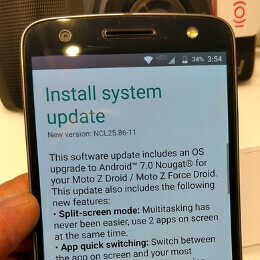 According to some users on Reddit, the Android 7.0 Nougat update (software version NCL26.86-11) will take just about 20minutes to install on your phone. The new update comes with new features like split-screen mode, quick app switching, new Data Saver, and also support for Google Daydream VR. This actually makes the Moto Z Droid and Moto Z Force Droid the first set of Motorola Android smartphones to receive the Nougat update. Other Motorola Moto Z and Moto G are expected to receive the update before the end of the year.